Perhaps never have the Bulls been as popular as they likely will be for the next two weeks in the Eastern Conference finals starting Sunday in the United Center. Can you measure a whole basketball world rooting against one team? Human emotion is both difficult to predict and often irrational. And if everyone is not fully sure why, they don’t seem to like the Heat. Though from a basketball perspective this conference finals series also is something of a measure of the traditional NBA theory of accumulating star talent versus the purist view of building a team. Can team basketball triumph over evil, ah, I mean individual excellence? The curiosity despite the disparate makeup is these are similar teams, more reliant on defense. The Bulls were first in opponent field goal defense and the Heat second this season. The Bulls were first in rebounding and the Heat was second. In the playoffs, the Bulls are first in fewest points per possession and the Heat is fourth. The Bulls are second in fewest points allowed and the Heat fourth. Even on offense, which should favor the Heat, it is remarkably close. Miami is seventh in shooting and the Bulls eighth. The Bulls are fifth in scoring and the Heat sixth. The three games between the teams this season were decided by eight total points and all on the final possessions. It’s likely going to come down to who makes the plays and executes best, as the coaches like to say. So here’s a look at how the games are likely to go, what the teams will be trying to do and how the matchups might work out. The Heat is going to trap Derrick Rose, more like what the Bulls saw in the Pacers series than in the Hawks series. It’s the cut-off-the-head-of-the-snake thing, though we’ve felt LeBron James has more been considered the reptile this season. They ostensibly start Mike Bibby at point guard, but he plays in rotation like Keith Bogans and not in the fourth quarters. Their game is to try to force turnovers as James and Dwyane Wade both rank in the top three in the NBA in fast break points. It will be important for Rose to move the ball and not try to dribble too much or try to dribble through the traps. They’re very good at deflecting balls, which prompts their fast break. If they get out and run they are virtually unstoppable because of James and Wade. Thus it is also vital for the Bulls to get back in transition. I’d play it like the Spurs did in the Finals in the early 2000’s shutting down Jason Kidd’s fast break and forcing those fast break/weak shooting Nets into a half court game without great shooters. The Bulls aren’t known as a good shooting team. But they are about even with Miami in playoff field goal percentage and much better in three point shooting, where the Heat rank 12th among 16 playoff teams with everyone behind them out of the playoffs. But with James and Wade the Heat can play a version of the Bulls old Doberman defense they used with Michael Jordan and Scottie Pippen, attacking ball handlers and getting out for easy baskets. The best way to counter that against Miami is to employ the weak side big more. Miami will trap the pick and roll. 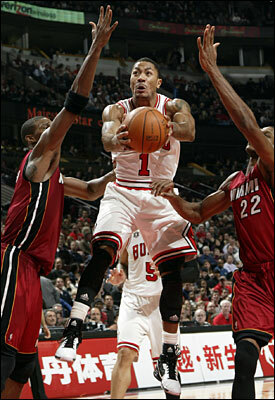 When the Bulls screener releases, that’s where Rose usually goes with the ball. Say it’s Joakim Noah. Carlos Boozer or Taj Gibson, depending on who is in, then should come up off the baseline. In Miami’s defensive scheme, they like to keep you on one side of the floor where they can bring pressure and then bring the other big man off the baseline. Miami likes to jam one side of the floor. But if the Bulls’ big man comes up on the weak side to make a play it further spreads the floor and leaves gaps in the Miami defense. Thus also making it more difficult to get a turnover. So Boozer also will have to be more aggressive coming out on offense, which is where he had more success in that closing game in Atlanta. Boozer has been better playing off the elbow or wing and then making a move or jumper, the area less clogged and giving him room to work. He’ll be important in this series because Miami will challenge someone else to make plays. The Bulls main offensive issue all season has been someone else but Rose to make a play, though the Bulls did survive it against the Hawks’ several playmaking guards with more aggressive defense. Like Jordan and Pippen did, James and Wade like to play the passing lanes, and Wade will play off Keith Bogans. Bogans did shoot 38 percent on threes this season, and it would be worthwhile to try to find him more in the deep corner. Incidentally, that’s where the Bulls have to watch the Heat shooters most. James Jones won the All Star three point contest and Bibby and Mike Miller, though the latter two ineffective this season, have a much higher percentage shooting from that short corner than on top. So the Bulls have to try to flush them out of the corners. I’d like to see Rose try to do more in the midrange game. He was excellent shooting that his first two seasons in the NBA. But he’s gone away from that more for the drive and three pointer. It’s an effective weapon and as good a free throw shooter as he’s become it’s a weapon the Bulls really aren’t using enough. Defense is where the Bulls can win this series with their edge in size, though Wade and James, obviously, are not ordinary opponents. The Bulls will have to make it difficult for them as there is no ultimate stopping of great players. I’d probably trap Wade. Bogans will likely start on him. Ronnie Brewer played him some in the regular season and I’d finish games with Rose on Wade as Rose is the team’s most athletic player. Wade prefers to isolate, so you actually want to ride him toward a screen for help. You want to make him give up the ball more. James tends not to fight the traps as much as Wade and will give it up more on a show. You want to keep Wade out of that lane as much as possible. They’ll take a lot of jump shots if they get hung up on the outside. The Bulls defensive strength this season has been the shell around the lane they’ve been so good building, and it’s an effective deterrent against a team like the Heat. You want to try to keep James on the wing rather than on top of the floor. When James is on the wing he tends to take a bad jump shot or pass the ball. He likes to skip pass from there across to Jones. If James gets on top he’s too dangerous with the ability to break down the defense. With Bosh, the plan always is to play physically. Likely, the Bulls will use Noah against him. Bosh’s dislike for physical play was never more apparent in the first game between the teams when he complained afterward that Omer Asik shouldn’t have dived for a ball because he could hurt someone. Namely Bosh. Though Kurt Thomas hasn’t played much in the playoffs, it might be worth a few minutes to bang on Bosh some. The more you do the farther from the basket he goes. And he did put up a one for 18 game against the Bulls in the second game between the teams. The Heat rely on Bosh for rebounding, and banging him around will distract him. Although the Bulls will rely on their defense, they will have to score. Yes, it is an annoying part of the game. Bulls coach Tom Thibodeau often goes for four or, at times, five reserves. But I’d probably want to keep two from among Rose, Boozer and Luol Deng on the floor at all times. I’d probably get Boozer out early so I could bring him back with the second unit for a bit more offensive potential. Since Miami isn’t big, I also can see Boozer playing some with Gibson. Maybe some of C.J. Watson with Rose for another playmaker on the floor. One of the Bulls favorite plays is the dribble handoff coming off the wing for Deng. The Heat do a good job of jamming that and that’s another opportunity to get something off the weak side. You also want to get into early offense against Miami, make them work, though Wade and James are terrific closing when they are into it. What happens if you go deep in the shot clock is they tend to play you more physically and it generally is allowed more when the clock is running down. Which brings us to the calls, which fans of both teams will disagree vehemently with throughout the series. With two defensive teams that play physically, it’s going to be a difficult series to officiate. Generally, there are few fouls called on James and Wade, though moreso James despite his reputation as a tough player and defender. It sometimes seems almost inconceivable, like in their first round Game 3 in Philadelphia, when they played a combined 78 minutes and were called for one foul. In two of the five games in the 76ers series, Wade wasn’t called for a single foul, though he does get more called on him than James. Based on his reactions, it doesn’t appear yet Wade believes he has committed a foul in his NBA career. In the last four games against the 76ers, James was called for a total of six fouls. Even against Boston in what was supposed to be a physical series, James was called for one foul in 46 minutes in the closing game. James is averaging 9.2 free throws per game in the playoffs and Wade 9.4. Bosh is averaging six. Overall, the Heat is averaging 29.7 free throws per game in the playoffs. The 76ers averaged 17.4 in the first round and the Celtics averaged 21.4 in the second round. You’ve got to push the ball and force the action against them and get to the line as well. James and Wade generally play most of the game with James averaging 44.6 minutes against Boston and 42.4 minutes against the 76ers. Wade averaged 40.8 minutes against Boston after 38 minutes against Philadelphia. Does the NBA want the Heat to win? No. The Bulls with Rose are a big TV draw now. So forget that stuff. The Heat likely will put James on Rose at the end of games to make his drives and floater more difficult by having to shoot over size. I think they’ll put Wade on Deng then as Deng isn’t generally going to back down a smaller player. James will also play most positions and will play a lot of power forward in a screen roll with Wade that will test the Bulls big men. Udonis Haslem did play briefly in the Boston series, and he could return to at least play physically against Boozer. And once the games begin then the adjustments really come. It should be a tough, long series. And then come the psychological factors, the fan and media who-wants-it-more stuff. Coaches like to talk about having a “respectful fear,” meaning about the result. The Bulls have handled this season with great aplomb, and it’s been a terrific ride. If they were to lose a Game 7 at home, they’d probably get a standing ovation of thanks. If the Heat were to lose a Game 6 at home they’d probably be booed and skewered by the basketball world in a cascade of I told you sos. Coaches always talk vaguely about having that “edge,” though what it entails is unclear. Generally you seem to have a greater so called edge when your fear of failure is highest. Do the Bulls have that? Do they need that? Bibby probably will play Bogans, which leaves Wade on Rose. Miami generally doesn’t like to do that as it could tire Wade for offense. Mario Chalmers played well against the Bulls in all three regular season games and almost won the third down the stretch. He has bothered Rose in the past and some of Rose’s biggest turnover games have come against Chalmers, though not this season. They have a history from the NCAA game Chalmers’ Kansas team won when Chalmers hit and Rose missed. Heat coach Erik Spelstra, unlike Thibodeau, changes lineups almost daily and I wouldn’t be surprised if he starts and plays Chalmers long stretches, assuming Chalmers can stay out of foul trouble. Then he can keep Wade on Bogans and in the passing lane. Bibby is nothing more than a stand still shooter now and arguably the league’s worst perimeter defender. Big edge to the Bulls if he starts as it’s important for the Bulls to get off to fast starts. Bogans can be a pest and did a good job shadowing and annoying Joe Johnson against the Hawks. Though Wade is several steps above. He’ll play off Bogans and Bogans will have to shoot when open. You have to stop Wade coming out of the backcourt even after made baskets as he’ll take it to the rim more than James. You can run out on him as he likes to complain about non calls and the Bulls should push every time he shoots, especially if Bibby is the other guard. Brewer will take a turn and this will be a better series for Kyle Korver with their slow perimeter shooters. Luol always draws the short straw, but Deng has played James for several years and does a reasonable job controlling him. Also, Deng’s movement will be crucial in keeping James occupied and less able to play the lanes and steal balls. James likes to ball watch a lot and can leave himself open for back door action as the Heat isn’t exactly brilliant in protecting the rim. There’s plenty of storyline here, and no one missed Boozer, who lives in the offseason in Miami, saying after the Bulls beat Atlanta how Miami is so tough with two stars. Boozer had a big Game 6 after being the target of fan and media abuse for weeks with uneven play. He came to the Bulls after Bosh passed and only averaged 13.3 points on 46 percent shooting against the Heat this season. His offense could be a turning point in the series, especially as Bosh doesn’t like to defend much. And his injured toe seems better. If Boozer can hit his shot and draw Bosh from the basket, the Heat’s rebounding will suffer. Boozer generally plays the weaker offensive player, meaning Noah likely will guard Bosh. But the Bulls will run bodies at Bosh with Omer Asik, Gibson and perhaps Kurt Thomas. Bosh, too, could be the X-factor as the Heat rely on him more than the Bulls do on Boozer and when the Heat get 75 points from their main three guys they rarely lose. It’s really anyone’s guess as Spoelstra changes here like with underwear. Zydrunas Ilgauskas started early in the Boston series, but has trouble moving on the stilts he seems to be using when he plays. Anthony has been a surprise with his hustle and activity and seems to fit their style better with Chalmers at guard. They brought out Juwan Howard against Boston and when they played the Bulls this season they mostly were using Erick Dampier, who also is way too immobile. It’s a series where Noah’s court sprinting could yield dividends. Both are known for defense and relatively inexperienced as head coaches, though Thibodeau was a virtual co coach in Boston when they won the title. Spoelstra hasn’t seemed to settle on a rotation all season, and it probably took Pat Riley stepping in to defend him early in the season for him to keep his job. He still hasn’t seemed to have worked out the James/Wade end game scenario and doesn’t have near the big game experience of Thibodeau. The Bulls’ depth was a major factor in the Hawks series and the Bulls have high level players to go to when a starter, other than Rose, is faltering. That likely was why Gar Forman was co-executive of the year with Riley and would have won if three teams didn’t split votes with John Paxson. The Bulls have a much deeper team with more versatility while Miami could be in huge trouble with too many fouls. Eddie House, Mike Miller and James Jones are three point shooters in theory to play off James and Wade. But only James seems reliable. Often the Heat bench cannot produce 10 points. I’ve wrestled with this given the Heat winning two series in five. But the 76ers were right there at the end of just about every game and the Celtics were decimated and staggered by the time the Heat took them down. Miami still plays way too much isolation and depends on too many jumpers from Wade and James, who really aren’t great shooters. If the Bulls had one more guard who could make his own plays I’d take the Bulls in five. As it is, it should be close and home court the edge in the end.